Plant-based clean up technologies are gaining popularity as a sustainable solution to contaminated soil remediation. In particular, plant-assisted bioremediation or phyto-assisted bioremediation exploits the synergistic action between plant root systems and natural microorganisms (bacteria and fungi) to remove, convert or contain toxic substances in soils, sediments or water. It can be applied successfully to contaminated areas. It relies on the use of a selected appropriate plant species for stimulating the biodegradation activity of natural soil microorganisms in the rhizosphere (e.g. through root exudates production or oxygen transport). Plant species can also produce extracellular enzymes that directly transform contaminants and/or make them more bioavailable. Moreover, they can also phyto-contain them. In selecting the plant species, the specific contaminant/s to be removed, and the local geopedological and climatic conditions need to be considered. Beyond the contaminant removal, there are additional benefits such as soil quality improvement, soil carbon sequestration and biomass production for energy purposes. The difficulties in remediating areas characterized by multiple pollutant occurrence (e.g. organic and inorganic toxic compounds) make the study of plant-microbial interactions important if sustainable soil recovery strategies are to be achieved. 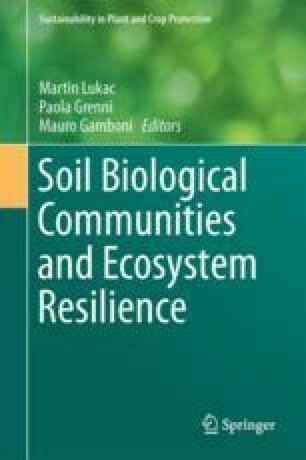 Consequently, in recent years, several plant species have been tested for stimulating natural microbial communities and supporting the remediation of contaminated soils. Among these, the poplar tree can be considered suitable for plant-assisted bioremediation purposes. In this chapter an example of the methodological approach used for its application to an area multi-contaminated (by polychlorinated biphenyls and heavy metals) is illustrated. The authors acknowledge CISA S.p.A. (Massafra, Italy), which partially funded the Research Project “Applicazione di tecniche di fitorimedio a basso costo in località ex campo Cimino-Manganecchia a Taranto”, Prot. IRSA-CNR N. 0005159, 04/12/2012. Authors thank contribution by COST Action FP1305 “BioLink-Linking belowground biodiversity and ecosystem function in European forests”.